Animal and veterinary sciences major Gary Coleman is a first-generation cattleman who exemplifies all that an entrepreneur should be. Coleman was named one of The Progressive Farmer’s America’s Best Young Farmers and Ranchers for 2013. The program recognizes leaders in production and management innovation, and for involvement in their communities. Coleman’s C. Calf Farms includes a 274-head cow/calf operation specializing in Angus and Brangus cattle, a facility that turns out 800 calves a year, hay sales, a pay-and-fish operation, feed mixing and sales, and a mobile meat store — Coleman 3 Meats. His meat products are hormone- and antibiotic-free beef, pork and goat — about 800 to 1,500 pounds per month. The Anderson native’s cattle enterprise began when he was in ninth grade, and he bought a few steer calves while working at a local dairy. 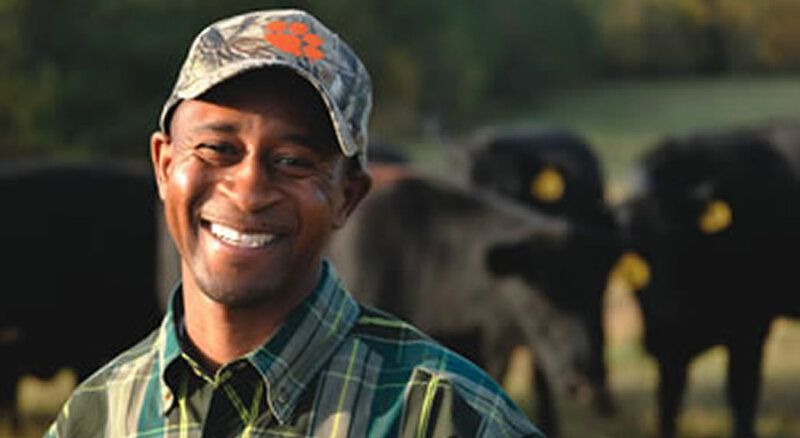 By the time he entered Clemson, his business included 70 brood cows. A few years later he experienced a huge setback when he lost 500 heifers and bull calves in a barn fire. Coleman started again, and his perseverance paid off as he built his enterprises. He works closely with the Natural Resources Conservation Service to make sure conservation is an important part of his management efforts. Participation in leadership development events has allowed Coleman to bring ideas and practices from around the world back to his community. He served as the U.S. representative at the 2011 Five Nations Beef Alliance conference as a member of the Young Producer’s Council, and is active in several cattleman associations.